I'm working on an isometric 'interpretation' of Arnold Boecklin's famous painting. I've done it for a tee-shirt design contest at Threadless (theme was Death, brief required to include a skull in the design) (insert skull smiley here). I've already submitted it because of the deadline, but I'm not all that happy with it and I'd like to keep working on it. 9 colors, that's 8 inks (max allowed) plus black bg. No AA because it's useless for printed art, although I could make an AA-ed web-only version. I'm planning to add more funereal details, redo the boat wake (and the boat), and generally polish details. What do you think? Are there any strong basic issues that should be addressed first? Love the skull shape though! i really love the concept and the palette, and the skull silhouette is rather clever. There is some questionability about the isometric nature in certain areas but i dont feel personally it heavily detracts from the image. what i think i would find most useful as an edit or addition to this piece, is using more lit and shadowed land features to help give the skull itself greater shape and form and depth. For instance you do a very nice job of this around the eye sockets and jaw, but as it fades to the rest of the skull, it appears flat by comparison. this way you also get a greater illusion that youre looking at a skull _first_ and secondary as a whole landscape scenery. also i think if youre going to do the water aspect of it which i really like, i say really go for it and try to incorporate it well instead of just barely a subtle hint of it. it could add another dimension of depth to your composition i think. Here's some early stages of the monochrome job, featuring several bg options: 1 = first layout; 2 = stylized volumes with highlighted edges; 3 = rounder volumes with shading; 4 = final monochrome. All elements are layered, the small details are separate so it wouldn't be too much of a hassle to make heavy changes in the bg landscape. It's true that I didn't give it as much attention as the fg, mostly for lack of time, and also I wanted the fg to be the main focus, so that it looked familiar to viewers who know the paintings. I used both variations of the amount of detail, and shading (getting darker the further back into the island) to convey this. I don't really want it to be obvious iso, but I do want it to be good iso! I'll double check to find any sore problems, please point them if you see any! About the water, I'm not sure I get what you mean. If it's about the boat wake, it's a bit lame and I plan to improve it, mostly to fade it more at left and bottom. I had no plan to make the water more present, except maybe showing a vague transparency with the dark tones where rocks drop into it. It might conflict with the reflections; I might have to get rid of one for the benefit of the other, gotta try. I won't go beyond that because the bg has to remain mostly uniform black (for printability, also I like the idea of that body of water being deathly still and dark), and also I don't think I've got the skillz for an acceptable large expanse of water! Didn't know about Isle of the Dead. 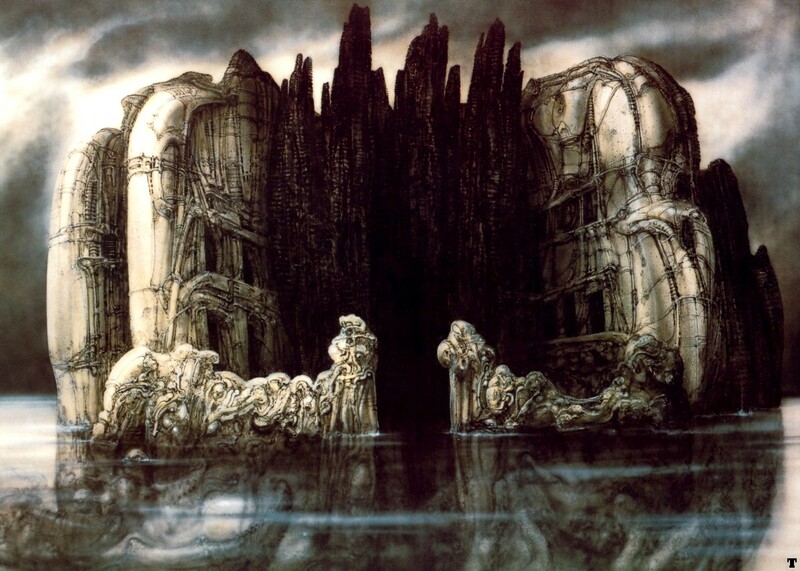 But when I clicked your reference link I was immediately reminded of something by Giger. He re-did Isle of the Dead at one point. Pretty cool. I agree, the perspective is hard to interpret at first. But I dunno, sometimes ambiguity like that can draw you in more. I hate to raise such a point but I actually wish you would've just stuck with the original isle geography and made a nice detailed rendering of it, in iso. Though, you would've had a hard time making the hidden skull thing work. Your colors are attractive but what if used a more macabre palette instead? I have to agree with you about the original island, but yeah, the skull just has to be there, so. Maybe another version sometime! Edit while previewing: it doesn't look all that hilly actually. It's the shading of the center / top that's wrong, I had it better in a previous version. I haven't begun detailing there at all, no big deal to fix tomorrow. Oh np. Ooh what if you attempted to make the upper part of the island/cranium bulbous and rounded just like a huge skull sticking out of the water? Or is that what you're already doing? Along with using lighting to do so, you can also communicate a rounded hilly shape by having little objects situated around the fringes of the cranium hidden by the raised ground in the center. And speaking of little fringe elements, why not some dead trees, small structures, etc. out in the water close to the island's edge? A suggestion because I find the edges of the island a little stark/abrupt. You might as well bump the color count up above 8 now, right? Maybe use some extra shades for some fine lighting, just a couple. This is a tough project to get to work right. I can tell it's one of those that's spawned by a moment of inspiration (namely the re-interpretation of Böcklin's painting) but not necessarily accompanied by a feasible means of manifesting the design successfully. It happens to me, too. These types of projects can be the most frustrating, but also the most satisfying if you get 'em right. Would be cool to have a shirt with this on it if you get it all fixed up. 2 latest versions: bulbous skull hopefully better than last night (left); and back to the flat geography but with more acute mounds (right). They don't look as different as I'd like them to be, and looking again at the earliest version they might be unnecessarily complicated. Dunno. The next step might be a barren, really round hilltop. Or a totally sandy low wasteland! At least I'm ok with the pointy, round hill shapes, as opposed to the more squarish iso-looking foreground. That should stay. I've also widened the gray palette to 8 colors (+black), up to now there were only 6 which was a bit silly since I intend to use the full color palette anyway. Mathias, nice idea about stuff in the water. I had been thinking of a half sunken boat wreck. I think this is a nice idea, the harbour & boat are great but so far they're the only part of the island that sustains interest and is convincing; the rest seems a bit vague and half-hearted. I scribbled out some ideas for simplification here, please excuse the messy edit; the canvas is huge I tried to incorporate a more cranium-like dome of previous commentator's recommendation and added some much needed additional trees as well as generally attempted to enhance the resemblance to a skull in profile. Things to note; the colours probably weren't a good idea; a bit of idle whimsy on my part. The main focal point is now the dome of the head and perhaps you want to keep it on the harbour. I would personally go 'to town' on a nice made-made structure (maybe a ghost town, burial ground or similar) on the top of the hill. You could also really take advantage of more opportunities to demonstrate overlapping areas of foreground to better sell a sense of depth. I'm torn about the general island contour shape. I had tried to make it look like the island map (top down view) would be skull-shaped, so the iso view would need to be foreshortened. Got to try your way and see. The trees and other detail will come back, don't worry! I just put them out of the way for the heavy landscaping job. "a ghost town, burial ground or similar": well you just started me thinking of Petra! Bocklin having painted hypogea, it wouldn't be totally out of character. I'll keep it very simple though (and dark? ), since I don't want to take the focus away from the harbour area.